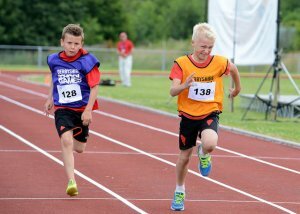 The Derbyshire School Games is popular across the county. The School Games is one of the flagship legacy programmes linked to the London 2012, with Olympic and Paralympic Games sit at the core of the Government's investment in school sport. The programme in Derbyshire is set across four levels and is backed by National Lottery funding from Sport England. It is supported by a range of partners including the Department for Education, Department of Health, Department for Culture, Media and Sport, the Youth Sport Trust and the British Paralympic Association. Email naomi.jones@activepartnerstrust.org.uk or call 07880 316006 for more information about School Games. Level 1: Intra School Competition. Level 2: Inter School Competition – within School Sport Partnerships / Area sections. Level 3: Inter School Competition – Derbyshire County Finals. Level 4: National School Games. Click here to see a photo gallery from the 2018 Derbyshire School Games Event. Increase the number and range of quality, inclusive opportunities so that more young people from primary, secondary and special schools can take part in school sport festivals and competitions. Support those with talent to progress through established pathways to a performance level as players, performers, leaders, coaches or officials. Organise Derbyshire schools' squads and teams which compete successfully at regional, national and international level. Contact Janice Price, Co-Chair of DSSA, for more information. You can find out more about the DSSA's latest work by downloading the report below. The Derbyshire School Sport and Physical Activity Awards, run by the Derbyshire Schools' Sports Association (DSSA) in partnership with Active Derbyshire, take place each autumn with individual and teams winners from across the county. Click on the link to find out more. If you have any questions or concerns about safeguarding during DSSA activity, please check out our guide by following the link.